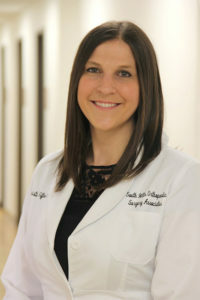 Kristina Ferenac has been helping patients at South Hills Orthopaedic Surgery Associates as a Physician Assistant since 2009. Ferenac received her Bachelor’s Degree in Health Science from Duquesne University, where she also completed her Master’s of Physician Assistant. She is involved in the American Academy of Physician Assistants, Physician Assistants in Orthopaedic Surgery, and has her board certification through the National Commission on Certification of Physician Assistants. “I like my interaction with patients, not only from a medical standpoint, but getting to know them personally,” she said.